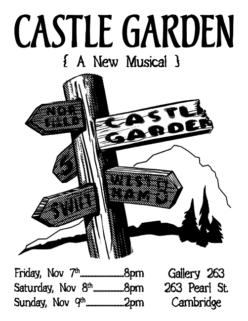 CASTLE GARDEN, a new musical from local playwright and musician Adam Baratz. CASTLE GARDEN tells the story of B., a nomadic musician, who undertakes a spirit journey to reconnect with his family. Doors open at 1:30 PM, appx. running time: 1 hr.